Did you get a Christmas cactus as a Christmas gift? These tropical plants are fairly hardy but do require some care to keep them thriving and blooming. If you have a plant-loving friend or relative, there’s a good chance you might have received a Christmas cactus as a holiday gift. 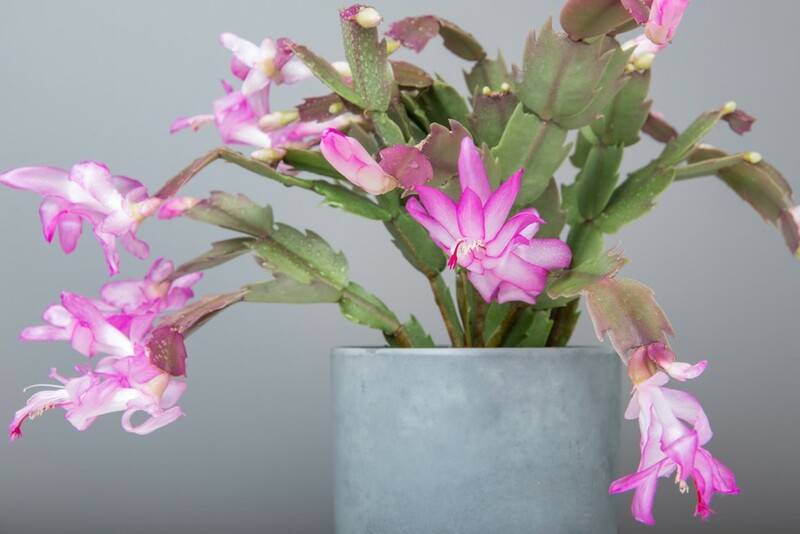 Although technically a member of the cactus family, a Christmas cactus is more similar to a succulent and does require some care to keep it alive and well. Also known as an Orchid Cactus, this winter-flowering houseplant is native to Brazil and grows in tropical rainforests. The plant features segmented, leaf-like stems with blooms at the ends that are typically bright pink, red, yellow, purple, or white. Although the plant usually flowers around Christmas time, hence the name, it can flower at other times throughout the year. 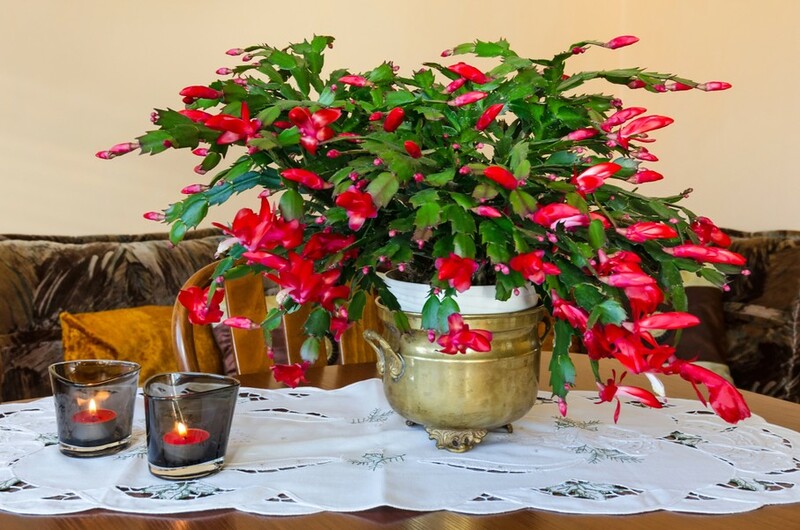 If you’re unsure how to care for your new plant, the following information will help you understand the needs of the Christmas cactus. There are two types of cactus or cacti. Most people are familiar with the spiny type that grow in arid deserts. Epiphyte cactus thrive in tropical rainforests. Epiphytes can be found in the forks of trees or clinging from large branches. Their roots are used to keep them attached to a host and openings in their leaves and stems absorb moisture from the air. They are more like air plants than true cacti. A Christmas cactus (Schlumbergera bridgesii) is an epiphyte. Keeping an indoor epiphytic cactus alive requires very different conditions than a desert cactus or other houseplant. 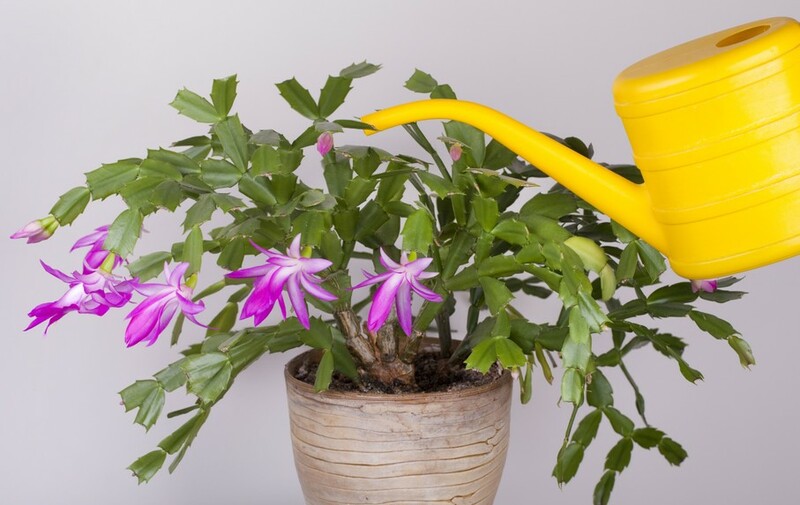 A Christmas cactus requires watering like any type of tropical plant. The soil should be kept damp, but not soaking wet. Most growers allow the top inch of soil to dry before watering the plant again. In hot, dry, weather, you may need to water more often. A Christmas cactus prefers about 50 to 60 percent humidity. Because they take in moisture from the air, you can place a glass of water near the plant to keep it hydrated. Over watering can cause brown spots on the stems or root rot. Too little water will keep the plant from blooming. 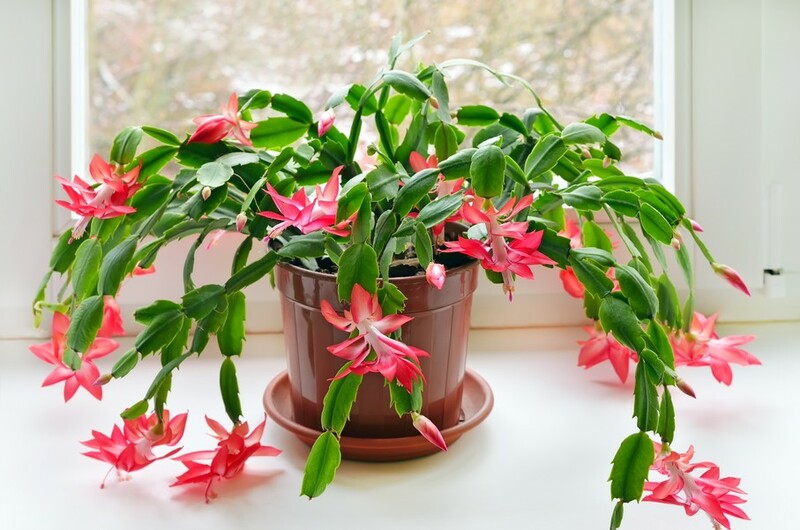 A Christmas cactus should be planted in soil that’s well-draining with lots of air space. The soil can be standard potting soil mixed with bark, peat, sand, or small gravel. Sand or small stones in the base of the pot will help with drainage. The plants grow best when in a snug pot where the roots almost seem too big for the pot. Fertilizer will help the plant flourish. A complete fertilizer like 20-20-20 at half strength can be added to the soil once a month. If you want the plant to bloom at a certain time, stop giving it fertilizer about a month before. Indirect sunlight is best for a Christmas cactus. They prefer full morning sun and then a shady spot for the rest of the day. Too much direct sunlight can actually burn the leaves. Placing the plant near windows that face east or north will best mimic natural growing conditions. The plant will adapt to low light conditions, but will grow better with indirect light. Being a tropical plant, a Christmas cactus likes it a little on the warm side. They do best at a temperature between 65 and 75 degrees. The exception to this rule is when you want the plant to bloom. How Do You Get a Cactus to Bloom? 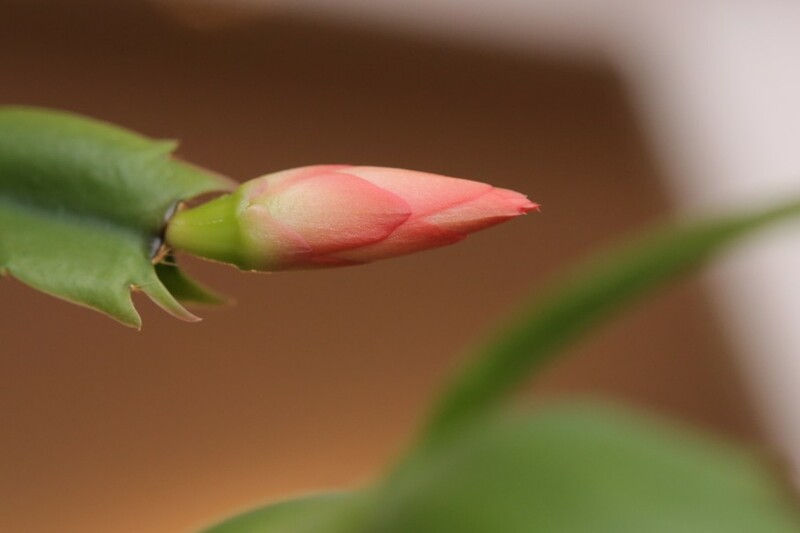 Certain conditions must take place to tell a Christmas cactus you’d like it to bloom. The plant can bloom at any time of year, but most people encourage blooms around Christmas time. Blooms occur after the plant emergences from dormancy. To simulate dormancy conditions, reduce watering to just enough to keep the soil slightly moist. The temperature must go down to 50 to 55 degrees at night and the cactus must sit in darkness for 12 to 14 hours at night as well. It takes about six weeks of cool, dark nights to encourage blooms. Most people start the process at the end of October. If you have an unused guest room in your home, you can use this room to start the process. Just make sure the plant does get sunlight and warmer temperatures during the day. 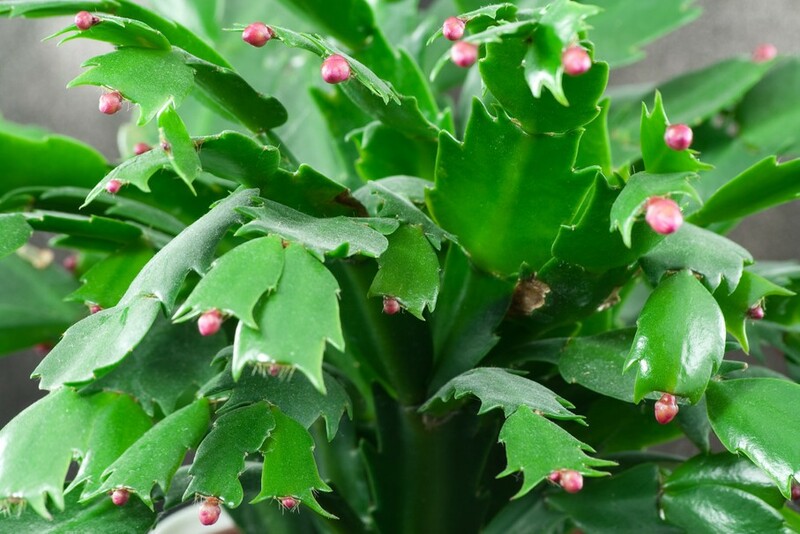 Once buds form on the end of the stems, move the Christmas cactus back to its usual location. Too much sunlight can cause the stems to droop and a drafty spot may cause the buds to drop off before blooming. It can take up to 12 weeks for colorful blooms to appear. Water the plant to keep the soil moist and allow it to get as much indirect sunlight as possible. This will encourage blooming. Under ideal conditions (not to hot, not too cold), the brilliant flowers will remain for up to eight weeks. 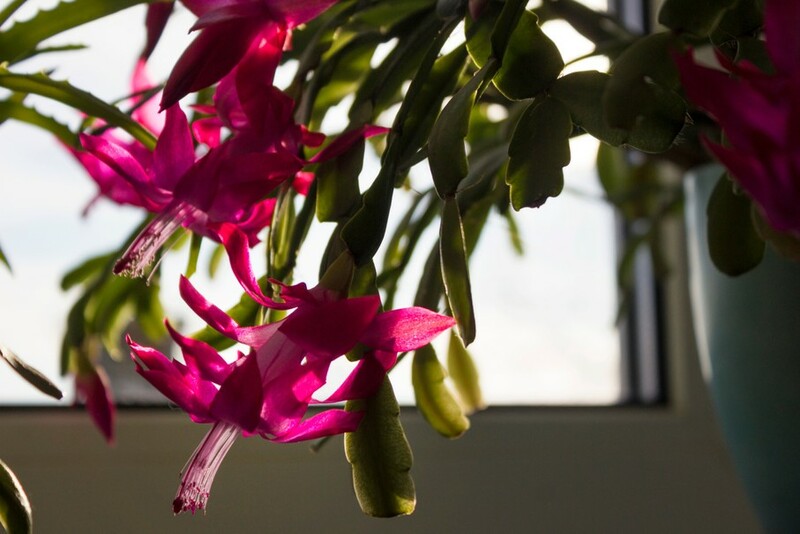 If your Christmas cactus is getting a bit too large, you can prune the plant by cutting off outside stems. If you would like to grow more plants, place the cut stems in a new pot of soil. At least one segment of the stem should be buried under the soil. Roots will form and allow the plant to grow. 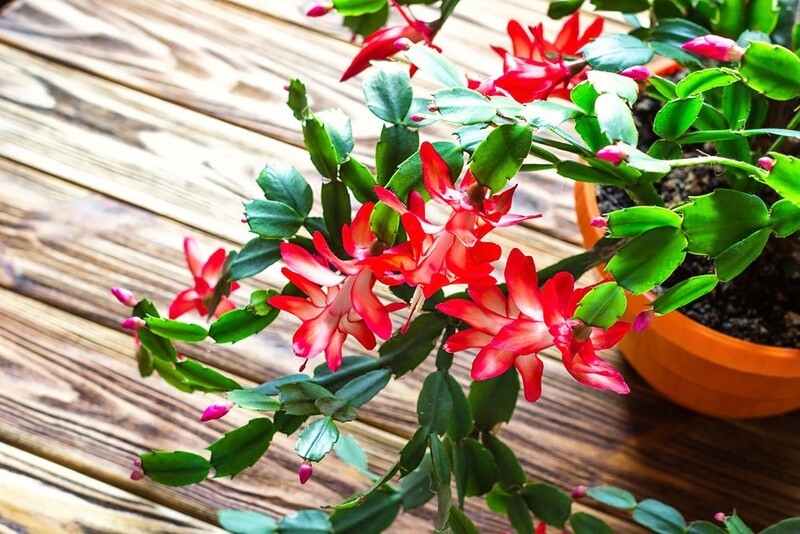 Christmas cactus plants are fairly hardy and adaptable, but they can suffer health problems if their environmental needs are not met. One of the most common problems is limp or droopy stems. This is usually a result of not enough water or too much direct sunlight. Poor draining soil or soggy roots from too much water can also make a cactus limp and droopy. If your plant has buds and they are falling off before they bloom, the problem is probably temperature or water related. To keep the blooms healthy, the soil must stay moist and the temperature a steady 65 to 75 degrees. Also, don’t give fertilizer to a blooming plant as that may cause the blooms or buds to fall off. 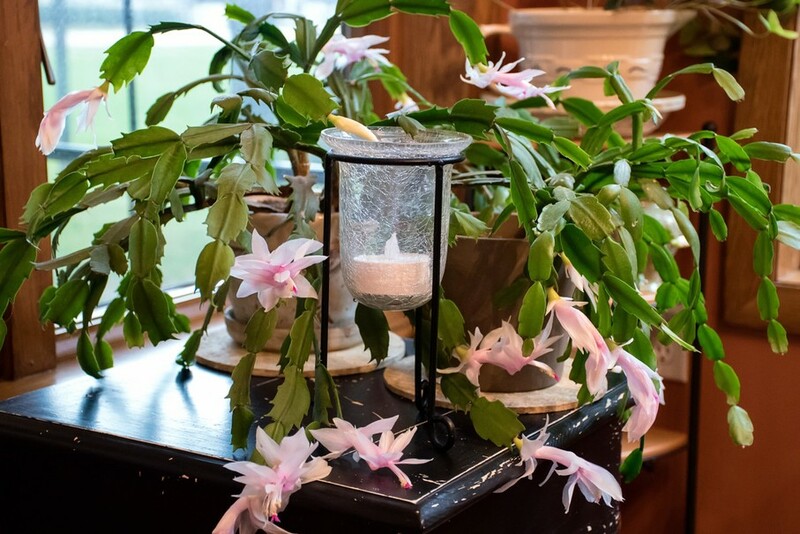 A Christmas cactus might seem like a difficult plant to care for, but if you enjoy growing plants, it only takes a little bit of effort to keep them healthy and happy. You can also have a beautiful blooming plant for the holiday season that friends and family will surly envy. They also make great gifts!